Looking for good books or movies? Get In the Hot Spot’s Great Reads and Great Movies series recommends only the best books and films to keep you entertained in between trips or during your travels. Like What We Did on Our Holiday, The Hundred-Foot Journey is a fun family movie with plenty of laughs and a lovely travel theme. Set in the south of France it has beautiful scenic shots and an engaging story about an Indian family who move to a small French village to start a new life. The Kadam family open a restaurant directly across the road from Madame Mallory’s Michelin-starred restaurant and immediately cause waves. While Madame Mallory, wonderfully played with a gorgeous french accent by Helen Mirren, is unhappy to have a cheap Indian restaurant open on her territory, some of the villagers are even more unhappy to have an Indian family in their midst full stop. Meanwhile the Kazam children are caught between wanting to fit in to their new milieu and trying their best to please their traditional Indian father. Friction ensues with lots of cross cultural comedy and cross cultural cooking battles as well as romance of course. Perfect for francophiles, foodies and anyone looking for an fun movie with a bit of drama, romance and comedy, The Hundred-Foot Journey is a film the whole family will enjoy. 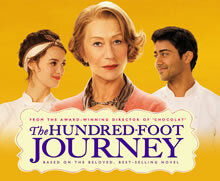 Watch the movie trailer below to get a taste for The Hundred-Foot Journey. It came out at movie theaters in 2014 so you should be able to borrow it from your local video store, library or download it online now. The Hundred-Foot Journey kept me perfectly distracted for a few hours on my long haul flight from Brisbane to Barcelona. I hope it delights and entertains you as much as it did me. Get In the Hot Spot’s weekly newsletter is an injection of tips to help you be more adventurous, have more fun and feel fabulous in midlife and beyond. Hit this link now so you never miss out on new stories. 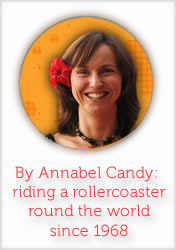 Thanks for the recommendation, Annabel. We’re always ripe for learning about a good movie that doesn’t have too much violence and if it has a few laughs, all the better. We’ll definitely check this one out. Previous post: Barcelona: My New Favorite City in the World!